If you are after a sense of perfect seclusion, Wasdale fits the bill. The only road in hugs the western shore of Wast Water, the remotest of all the Lakeland waters. 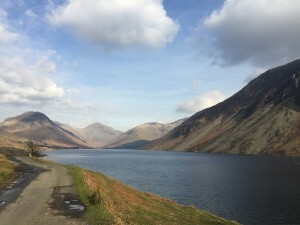 View of Wast Water from the road in. You look across the water to see the spectacular Screes , a dramatic edifice of rock that rises out of the eastern side of what’s reputed to be the deepest lake in Cumbria. As you venture further towards the hamlet of Wasdale Head, you leave Wast Water behind and see Kirk Fell immediately in front of you. Its rounded shape is comforting and reassuring until you approach closer and realise its brutal and sheer incline. To your left Yewbarrow rises; straight and direct with few contours to soften its features. To the right of Kirk Fell are Great Gable and Lingmell. These four mammoth hills serve as a welcoming and warming protective shield surrounding Wasdale from the harsh elements of the south west fells. They also intimidate and frighten those who dare to climb their peaks. But it’s Scafell Pike that we are here for. 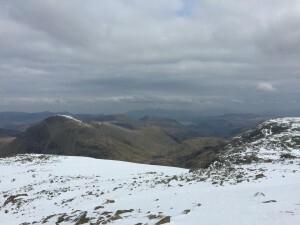 Yet its 937 metre peak – the highest in England – cannot be seen. Although hiding behind Lingmell, its intimidatory presence can be sensed immediately. From Wasdale we have options: we can either walk past a tiny church – supposedly the smallest in England – via Burnthwaite Farm and then up Lingmell Beck. With Great Gable and Lingmell itself either side of you, your path is clear and steady until you reach Sty Head. You then circle to the right following the Corridor Route to the top of Scafell Pike. We took the alternative path; a more direct and abrupt route . Leaving south east from Wasdale, we cross a patchwork of stonewalled fields before beginning a steep ascent. Hugging Lingmell Gill – which lies south of Lingmell itself – we climb quickly, following a stone-set path that offers little relent for quickly tiring limbs. Scafell Pike and its twin Sca Fell to its right now dominate our view. We take a right at a fork in the path, and then head towards Broad Strand. 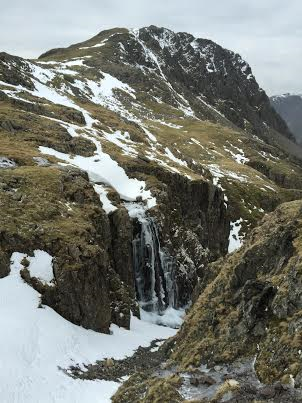 The path now becomes icy as we cross the snow line. The mountain sides close in. 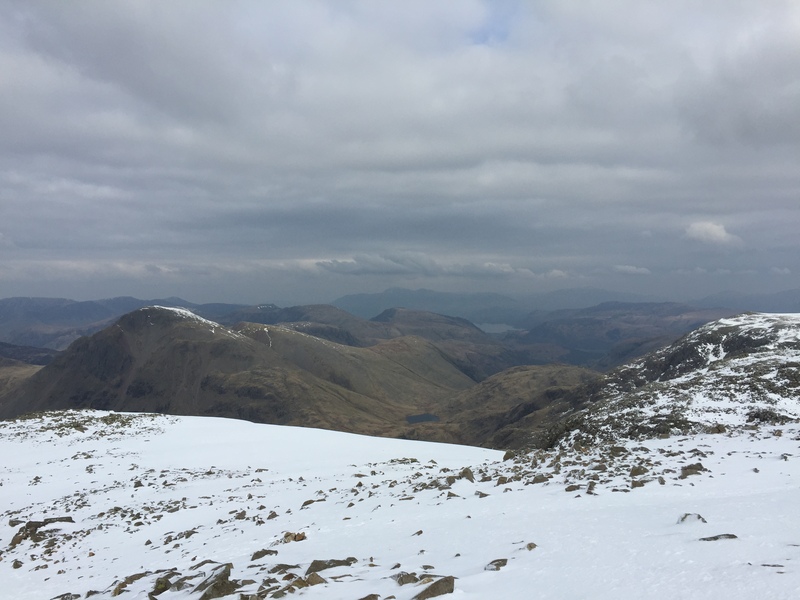 Scafell and Scafell Pike loom large. They look down at you dismissively, challenging you to venture further. Just before Broad Strand we take a sharp left and climb up to Mickedore, a summit that guards the entrance to Scafell Pike itself. The well-defined path is now lost to scree and rocks that block your route forward. Your boots slide and roll as you stumble on the loose scree, making your ascent that much harder. Scrambling on all fours you slowly pick your way up and across the frosted rocks in front of you. Our final ascent leads through a gully that narrows and twists before reaching the top. The summit is marked by a small circular stone shelter. Looking around, you have a view that few other peaks in the Lake District can match. It’s truly magnificent. We don’t stop for long though. Icy cold conditions soon makes us restless. We want to carry on walking in a north western direction. Our plan was to dip down and then climb quickly to Broad End peak. One inspection of the route makes us change our mind. Thick ice, a sharp drop and the simple laws of gravity make this route too treacherous. So we descend the way we came, back down Mickledore and Broad Stand before linking up with the far busier path at Hollow Stones. Again we climb, making up lost ground before joining the Corridor route. This pathway picks its way behind another summit called Great End before eventually linking up with the LIngmell Beck path near Sty Head Tan. From here our return home is more gentle. Gone is the scree and ice that have made our day so demanding. As we walk down Lingmell Beck a tight canvass of the vibrant green stone-walled fields, where our walk started, draws into sharp focus. And then – as the path dips southwards – Wast Water itself comes into view. You marvel at its tranquiled waters flanked on either side by the menace of enormous rock. You now know your day’s walking is nearly over. Rest and nourishment are on offer at the Wasdale Head Hotel. 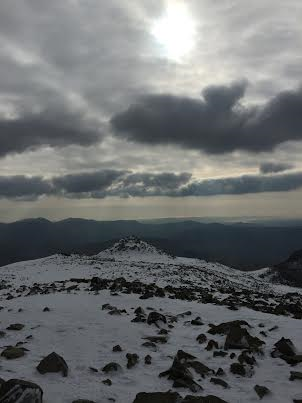 You sit down with plate and pint, reflecting on the day you climbed Scafell Pike. 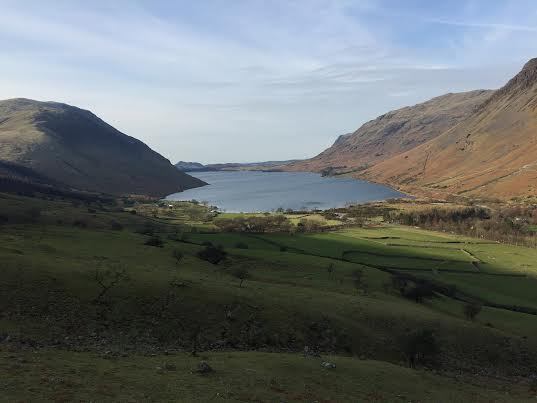 Your time in Wasdale is special. There are many magical places and villages in the Lakes. Yet you feel almost stunned by a unique sense of location based on remoteness and sheer natural beauty. Sitting in the hotel lounge a fellow guest more familiar with the area senses your wonderment. 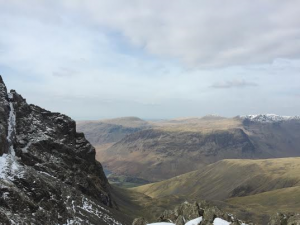 “Ah Wasdale”, he remarks, “The deepest water, the highest peak, the smallest church…” You nod in agreement expecting further superlatives “…and the biggest liar!” he adds with perfect comic timing. The ‘facts’ about Wasdale really are not important. It’s the time you spend there that matters. 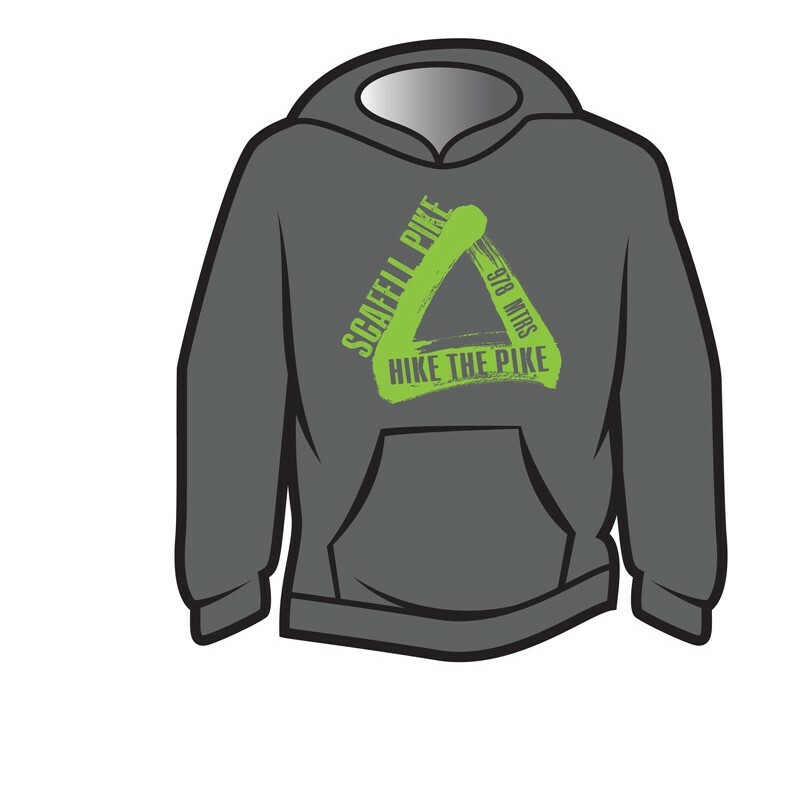 ← Fancy going on tour? … try ski touring.